1791: born in Edo. His father was the owner of a shibai jaya but it was said that he was a musician and a low-ranking samurai. His mother was the daughter of the star Ichikawa Danjûrô V.
8th lunar month of 1794: he appeared on stage for the first time, receiving the name of Ichikawa Shinnosuke I. 1797: Ichikawa Shinnosuke I took the name of Ichikawa Ebizô V.
6th lunar month of 1798: Ebizô played at the Nakamuraza 2 famous koyaku, Rokukimi and Antoku Tennô, in the classic "Yoshitsune Senbon Zakura". 5th lunar month of 1799: his adoptive father Ichikawa Danjûrô VI died. 11th lunar month of 1800: he was officially designated as the next holder of the prestigious name of Ichikawa Danjûrô. 30th day of the 10th lunar month of 1806 : his grandfather Ichikawa Hakuen I died. 1807: Ichikawa Ebizô V took the name of Ichikawa Danjûrô VII. 5th lunar month of 1808: Danjûrô played the roles of Senzaki Yagorô and Ôdate Samanosuke in the drama "Kanadehon Chûshingura", which was staged at the Nakamuraza. 7th lunar month of 1808: premiere at the Ichimuraza of Katsu Hyôzô I's drama "Toki-mo Kikyô Shusse no Ukejô"; Danjûrô played the role of Yasuda Sakubê [casting]. 1st lunar month of 1810: premiere at the Ichimuraza of Tsuruya Nanboku IV and Sakurada Jisuke II drama "Kokoro no Nazo Toketa Iroito"; Danjûrô played the role of Kanbara Sagorô [casting]. 3rd lunar month of 1810: premiere at the Ichimuraza of Katsu Hyôzô I's drama "Kachi Zumô Ukina no Hanabure" (commonly called "Shirafuji Genta"); Danjûrô played the role of Tsugawa Katsujirô [casting]. 5th lunar month of 1810: premiere at the Ichimuraza of Katsu Hyôzô I and Sakurada Jisuke II drama "Ehon Gappô-ga-Tsuji"; Danjûrô played the roles of Kojima Rimpei and the yamabushi priest Masuhôin [casting]. 2nd lunar month of 1811: Danjûrô played for the first time the prestigious role of Sukeroku in the drama "Sukeroku Yukari no Edo Zakura", which was staged at the Ichimuraza; his stage partners in the roles of the courtesan Agemaki and Ikyû are Iwai Hanshirô V and Matsumoto Kôshirô V.
7th lunar month of 1811: premiere at the Ichimuraza of "Tamamo-no-Mae Obana no Nishiki", the Kabuki adaptation of the puppet theater drama "Tamamo-no-Mae Asahi no Tamoto"; Danjûrô played the role of Wada Gorô [more details]. It was followed by the premiere at the Ichimuraza of the drama "Nazo no Obi Chotto Tokubê"; Danjûrô plays the role of the dôguya Seishichi, later Tsuribune Sankichi [more details]. 9th lunar month of 1812: Danjûrô played at the Ichimuraza the roles of Umeômaru and Terukuni in the drama "Sugawara Denju Tenarai Kagami"; the roles of Matsuômaru and Sakuramaru were played by Matsumoto Kôshirô V and Segawa Rokô IV. 3rd lunar month of 1813: premiere at the Moritaza of Tsuruya Nanboku IV's play "Osome Hisamatsu Ukina no Yomiuri" (commonly called "Osome no Nanayaku", in English "The seven roles of Osome"). The seven roles were played by Iwai Hanshirô V; Danjûrô played the roles of Kyûsaku and the sarumawashi Sajibei [casting]. 4th lunar month of 1813: Danjûrô played the role of the warrior Saitô Bettô Sanemori in the drama "Genpei Nunobiki no Taki", which was staged at the Moritaza. 6th lunar month of 1813: premiere at the Moritaza of the 8-role hengemono "Mata Koko-ni Sugata Hakkei"; the 8 roles were performed by Danjûrô. One of them, the one for the view "wild goose swooping down upon Katata in Autumn" ("Katata no Rakugan" in Japanese), has survived and became an independent popular dance item in the Kabuki repertoire, known under the titles of "Ômi no Okane", "Danjûrô Musume" (the Danjûrô Girl) or "Sarashima" (the Cloth-bleaching Girl). 1st lunar month of 1814: Danjûrô's rank in the Edo hyôbanki, tachiyaku section, was jô-jô-kichi (superior - superior - excellent). Premiere at the Moritaza of the Nagauta-based dance "Shôfudatsuki Kongen Kusazuri"; Danjûrô played the role of Soga Gorô Tokimune [casting]. 3rd lunar month of 1814: premiere at the Ichimuraza of Tsuruya Nanboku IV's drama "Sumidagawa Hana no Goshozome", commonly called "Onna Seigen"; Danjûrô played the roles of Yoshida Matsuwakamaru, the Iruma's tsubone Iwafuji, the yakko Gunsuke, the carver Hidari Jingorô and Awazu Rokurô [more details]. 5th lunar month of 1814: premiere at the Ichimuraza of the 12-role hengemono "Manete Mimasu Shiki no Wazaogi", which was performed by Danjûrô. One of the roles, "Tonbi Yakko", is still part of the current Kabuki repertoire. 7th lunar month of 1814: Danjûrô played for the first time at the Ichimuraza the role of the smuggler Genkai Nadaemon in the drama "Imaori Hakata no Irifune", which was very similar to "Kezori". His stage partners were Seki Sanjûrô II (Komachiya Sôshichi) and Ichikawa Dannosuke III (the courtesan Hakata Kojorô). 3rd lunar month of 1815: Danjûrô played in the same theater the roles of Kumagai Tarô and Minamoto no Yoshitsune in the classic "Yoshitsune Senbon Zakura". 4th lunar month of 1815: the actors Danjûrô, Matsumoto Kôshirô V, Iwai Hanshirô V and Seki Sanjûrô II moved to the Kawarasakiza, which was about to reopen. 5th lunar month of 1815: premiere at the Kawarasakiza of Tsuruya Nanboku IV's drama "Kakitsubata Iro mo Edozome" (commonly called "Oroku to Gantetsu" or "Dote no Oroku"); Danjûrô played the roles of Omamori Denbê and Sano Jirôzaemon [casting]. 7th lunar month of 1815: premiere at the Kawarasakiza of Tsuruya Nanboku IV's drama "Haji Momiji Ase no Kaomise" (commonly called "Date no Jûyaku", in English the ten roles of Date), whose plot and characters belonged to the "Meiboku Sendai Hagi" world; the ten roles were played by Ichikawa Danjûrô VII [casting]. 8th lunar month of 1815: Danjûrô played at the Kawarasakiza the roles of Tadanobu and Yokawa no Zenji Kakuhan in the drama "Yoshitsune Senbon Zakura"; his stage partner in the role of Shizuka Gozen in the michiyuki "Michiyuki Hatsune no Tabi" was the onnagata Segawa Tamon I. 9th lunar month of 1815: Danjûrô played in the same theater the roles of Ôboshi Yuranosuke, Hayano Kanpei, Ichimonjiya Saibê and Amakawaya Gihei in the drama "Kanadehon Chûshingura"; his stage partners were Segawa Tamon I (Okaru), Iwai Kumesaburô II (Oishi, Osono) and Seki Sanjûrô II (En'ya Hangan, Teraoka Heiemon). 1st lunar month of 1816: premiere at the Nakamuraza of the new year sogamono "Hiyoku no Chô Haru no Soga Giku". This new year drama mixed two sekai: it was a sogamono and a gonpachi-komurasakimono. The sogamono fell into oblivion and the gonpachi-komurasakimono was staged independently under the title "Sono Kouta Yume mo Yoshiwara" ("Gonge" and "Gonjô"); Danjûrô played the roles of Soga Jûrô Sukenari, Soga Gorô Tokimune and Shirai Gonpachi [more details]. 7th lunar month of 1816: Danjûrô played at the Nakamuraza the roles of Momonoi Wakasanosuke, Ôboshi Yuranosuke and Ichimonjiya Saibê in the drama "Kanadehon Chûshingura"; the role of En'ya Hangan was played by Onoe Kikugorô III. 3rd lunar month of 1817: premiere at the Kawarasakiza of Tsuruya Nanboku IV's masterpiece "Sakura Hime Azuma Bunshô"; Danjûrô played the roles of the priest Seigen, Tsurigane Gonsuke (in reality Shinobu no Sôta) and Inanoya Hanbei [casting]. 2nd lunar month of 1818: the play "Kamakura Sandaiki" was staged for the first time in Edo, at the Nakamuraza; Danjûrô played the role of Miuranosuke [casting]. 4th lunar month of 1819: Danjûrô played at the Tamagawaza the roles of Ôboshi Yuranosuke, En'ya Hangan, Hayano Kanpei, Momonoi Wakasanosuke, Ono no Sadakurô, Tonase and Amakawaya Gihei in the drama "Kanadehon Chûshingura"; his main stage partners were Matsumoto Kôshirô V (Kô no Moronô, Teraoka Heiemon, Kakogawa Honzô), Segawa Kikunojô V (Okaru, Oishi) and Iwai Hanshirô V (Osono). 11th lunar month of 1819: premiere at the Kawarasakiza of the Nagauta-based dance "Shikakubashira Saru no Kusemai"; Danjûrô played the role of Konoshita Tôkichi [more details]. 4th lunar month of 1820: Danjûrô played at the Kawarasakiza the roles of Kajiwara Genta Kagesue and Hatakeyama Shigetada in the drama "Hirakana Seisuiki"; the role of Chidori was played by Ichikawa Monnosuke III. 5th lunar month of 1821: Danjûrô played at the Nakamuraza the roles of Momonoi Wakasanosuke, Hayano Kanpei and Ishidô Umanojô in the drama "Kanadehon Chûshingura". 3rd lunar month of 1823: premiere at the Ichimuraza of Tsuruya Nanboku IV's drama "Ukiyogara Hiyoku no Inazuma"; Danjûrô played the roles of Fuwa Banzaemon, Banzui Chôbê and Teranishi Kanshin [casting]. 5th lunar month of 1823: Danjûrô played at the Ichimuraza the roles of Matsuômaru and Terukuni in the drama "Sugawara Denju Tenarai Kagami"; the roles of Chiyo, Umeômaru and Sakuramaru were played by Segawa Kikunojô V, Seki Sanjûrô II and Onoe Kikugorô III. 7th lunar month of 1825: Danjûrô played at the Nakamuraza the roles of Momonoi Wakasanosuke, Senzaki Yagorô, Ishidô Umanojô and Amakawaya Gihei in the drama "Kanadehon Chûshingura". 7th lunar month of 1825: premiere at the Nakamuraza of Tsuruya Nanboku IV's ghost play "Tôkaidô Yotsuya Kaidan"; Danjûrô played the role of Tamiya Iemon [casting]. 9th lunar month of 1825: premiere at the Nakamuraza of Tsuruya Nanboku IV's drama "Kamikakete Sango Taisetsu"; Danjûrô played the roles of Sasanoya Sangorô (in reality Tokuemon's son Sentarô) and Itô Genshin (in reality Senzaki Yagorô) [casting]. 1st lunar month of 1826: Danjûrô's rank in the Edo hyôbanki, tachiyaku section, was dai-jô-jô-kichi (grand - superior - superior - excellent). 9th lunar month of 1826: Danjûrô played in the same theater the roles of Kajiwara Heiji Kagetaka, Matsuemon and Higuchi Jirô Kanemitsu in the drama "Hirakana Seisuiki"; the roles of Chidori and Ofude were played by Iwai Shijaku I and Iwai Kumesaburô II. 5th lunar month of 1827: Danjûrô played at the Ichimuraza the role of Kajiwara Heiji Kagetaka in the "Senjin Mondô" scene of the drama "Hirakana Seisuiki"; the roles of Kajiwara Genta Kagesue, Chidori and Enju were played by Bandô Mitsugorô III, Iwai Kumesaburô II and Kataoka Nizaemon VII. 6th lunar month of 1827: premiere at the Kawarasakiza of Tsuruya Nanboku IV's drama "Hitori Tabi Gojûsan Tsugi"; Danjûrô played the roles of Nakano Tôsuke (in reality Yui Minbunosuke), Botan Jishi no Hachi, Edobei (in reality Fujikawa Mizuemon), Mamushi no Jirokichi and Banzui Chôbê [casting]. 7th lunar month of 1827: Danjûrô played in the same theater the roles of Momonoi Wakasanosuke, Teraoka Heiemon, Ono no Sadakurô, Ôwashi Bungo, Kakusuke, Ishidô Umanojô and Amakawaya Gihei in the drama "Kanadehon Chûshingura". 9th lunar month of 1827: Danjûrô played in the same theater the role of Matahei in the drama "Keisei Hangonkô". His stage partners were Iwai Kumesaburô II (Otoku), Bandô Hikosaburô IV (Utanosuke), Ichimura Uzaemon XII (Shurinosuke) and Kataoka Nizaemon VII (Shôgen). 12th lunar month of 1827: Danjûrô played at the Kawarasakiza the roles of Kajiwara Heiji Kagetaka, Matsuemon and Higuchi Jirô Kanemitsu in the drama "Hirakana Seisuiki". 5th lunar month of 1828: Danjûrô played at the Ichimuraza the roles of Matsuômaru and Kan Shôjô in the drama "Sugawara Denju Tenarai Kagami". 11th lunar month of 1828: Danjûrô played at the Kawarasakiza the roles of Naniwa Rokurô, Princess Tatsu's yakko Mizuhei, Shibuya Konnômaru, the kagokaki Jinbê, the sumôtori Nuregami Chôgorô and Taira no Kiyomori in Mimasuya Nisôji's kaomise drama "Sakigake Genji no Kibamusha", which welcomed in Edo the actors Sawamura Gennosuke II, Arashi Danpachi and Yoshizawa Enjirô; his yearly salary is 700 ryô. 3rd lunar month of 1829: Danjûrô played in the same theater the roles of Kinugawa Tanizô, Hanyûmura Yoemon, Yashio, Nikki Danjô and Arajishi Otokonosuke in the drama "Date Kurabe Okuni Kabuki". 21st day of the 3rd lunar month of 1829: a fire broke out from the shop of Owariya Tokuemon, in the district of Kanda Sakuma-chô. It destroyed the Nakamuraza, the Ichimuraza and the Kawarasakiza. 15th day of the 4th lunar month of 1829: Danjûrô was at the Kôyasan where a commemorative stone was erected. 5th lunar month of 1829: he took the name of Ichikawa Hakuen II to play in Ôsaka at the Naka no Shibai the roles of Kajiwara Heiji Kagetaka and the sendô Matsuemon, in reality Higuchi Jirô Kanemitsu, in the drama "Hirakana Seisuiki". He also played the role of Danshichi Kurobê in the drama "Natsu Matsuri Naniwa Kagami"; the roles of Tsuribune Sabu and Issun Tokubê were played by Bandô Jutarô I and Ichikawa Danzô V.
10th lunar month of 1829: Hakuen played the roles of Ôboshi Yuranosuke, Hayano Kanpei and Ono no Sadakurô in the drama "Kanadehon Chûshingura", which was staged at the Shukuin no Shibai in Sakai; his stage partner in the role of Okaru was Fujikawa Tomokichi II. 11th lunar month of 1829: Hakuen played in Kyôto at the Kitagawa no Shibai the roles of Oda Harunaga and Katô Toranosuke in the kaomise drama "Matsushita Kaheiji Renga Hyôban"; his stage partners were Nakamura Utaemon III, Kataoka Nizaemon VII, Matsumoto Kôshirô V, Arashi Rikan II, Nakamura Matsue III, Iwai Kumesaburô II and Sawamura Kunitarô II. 1st lunar month of 1830: Danjûrô's rank in the Edo hyôbanki, tachiyaku section, was goku-jô-jô-kichi (extreme - superior - superior - excellent). At that time, he was still in Ôsaka, not in Edo! 3rd lunar month of 1830: Hakuen played at the Kado no Shibai the roles of Momoi Wakasanosuke, Ishidô Umanojô and Teraoka Heiemon in the classic "Kanadehon Chûshingura". He also played the role of Sukeroku in the drama "Sukeroku Yukari no Edo Zakura"; the roles of Agemaki, the shirozake seller Shinbê and Ikyû were played by Nakamura Matsue III, Nakamura Utaemon III and Matsumoto Kôshirô V.
Spring ~ Summer 1830: tour in Ise, Nagoya and Tateyama with Matsumoto Kôshirô V. Then, the two actors went back to Edo through the Nakasendô. 8th lunar month of 1830: he took back the name of Ichikawa Danjûrô VII and played at the Kawarasakiza the roles of Ishikawa Goemon, the kamiyui Misuji no Tsunagorô and Konomura Ôinosuke (in reality Sô Sokei) in the drama "Ichikawaya Masago no Gohiiki". 5th lunar month of 1831: Danjûrô played at the Kawarasakiza the role of the ferryman Tonbê in the drama "Shinrei Yaguchi no Watashi"; he creates the definitive kata for this role; the role of Tonbê's daughter Ofuna was played by Sawamura Gennosuke II. 7th lunar month of 1831: Danjûrô played at the Kawarasakiza the roles of the warrior Kumagai Jirô Naozane and Rokuyata in the drama "Ichi-no-Tani Futaba Gunki"; the role of Kumagai's wife Sagami was played by Segawa Kikunojô V.
9th lunar month of 1831: Danjûrô played in the same theater the role of Matsuômaru in the drama "Sugawara Denju Tenarai Kagami". 3rd lunar month of 1832: great shûmei at the Ichimuraza for the Naritaya guild. Ichikawa Danjûrô VII took back the name of Ichikawa Ebizô V and his son Ichikawa Ebizô VI, who was only 9 years old, took the name of Ichikawa Danjûrô VIII. Ebizô played the roles of Sarushima Sôta, Iwafuji and Yoshida Matsuwakamaru in Tsuruya Nanboku IV's drama "Sumidagawa Hana no Goshozome". He also played the prestigious role of Sukeroku in the drama "Sukeroku Yukari no Edo Zakura"; his stage partners in the roles of the courtesan Agemaki and Ikyû were Iwai Hanshirô V and Matsumoto Kôshirô V. "At the same performance, he published a document that established the "Kabuki Eighteen" (Kabuki Jûhachiban), a collection of plays that were closely associated with him and his predecessors in the Danjûrô line ". 4th lunar month of 1832: Ebizô played in the same theater the roles of the boatman Matsuemon, Higuchi Jirô Kanemitsu and Kajiwara Heiji Kagetaka in the drama "Hirakana Seisuiki". He also played the role of Soga Gorô in the short and bombastic play "Ya-no-Ne". The role of Soga Jûrô is played by Ichimura Uzaemon XII. 11th lunar month of 1832: Ebizô moved to the Kawarasakiza and played several roles, including Narita Gorô and Ashigarayama no Yamanba, in the kaomise program. His son Ichikawa Danjûrô VIII played for the first time the leading role of the "Shibaraku" scene. 3rd lunar month of 1833: Ebizô played in the same theater the roles of Ôboshi Yuranosuke, Hayano Kanpei, Momonoi Wakasanosuke, Teraoka Heiemon and Amakawaya Gihei in the drama "Kanadehon Chûshingura". 2nd lunar month of 1836: Ebizô played at the Moritaza the roles of Genzô, Yuranosuke, Oniô Shinzaemon, Tanuki no Kakubei, Izu no Jirô, Hisaage Zenji, Matsuômaru, Kakogawa Honzô, Ômi no Tôta, Kakuju, Oishi, Soga Mankô, Terukuni, Ishidô Umanojô, Tenpaizan no Kan Shôjô, Ôwashi Bungo, Taira no Kagekiyo, the wooden statue of Kan Shôjô, the statue of Fudô Myôô and Momonoi Wakasanosuke in the drama "Sugawara-ryû Kanagaki Soga", which mixed the worlds of "Kanadehon Chûshingura", "Sugawara Denju Tenarai Kagami" and the Soga brothers (sogamono). 4th lunar month of 1836: premiere at the Moritaza of the drama "Hakkenden Uwasa no Takadono"; Ebizô played the roles of Ôtsuka Shinjirô, Fukami Katsugorô, Inuta Kobungo, Inuyama Dôsetsu, Inuzuka Shino, Inumura Kakutarô, Aboshi Samojirô, Tsuchida Dotarô and the wicked priest Narukami [casting]. 11th lunar month of 1836: premiere at the Moritaza of the Kiyomoto-based dance-drama "Kurama Jishi Oshie no Hinagata", which stars Ebizô, Sawamura Tosshô I and Onoe Kikujirô II [more details]. 1st lunar month of 1838: Ebizô played at the Kawarasakiza the role of the warrior Kumagai Jirô Naozane in the drama "Ichi-no-Tani Futaba Gunki", which was included in the new year program "Fude Hajime Mazebari Soga"; the role of Kumagai's wife Sagami was played by Ichikawa Danzô V.
3rd lunar month of 1839: premiere at the Kawarasakiza of the dance program "Shiki no Nagame Maru-ni-I no Toshi", which was made up of four dances dedicated to the four seasons and starred the actor Sawamura Tosshô I, supported by Ebizô and Ichikawa Danjûrô VIII [more details]. 9th lunar month of 1839: premiere at the Kawarasakiza of the Kiyomoto-based dance "Shimero Yare Iro no Kakegoe", which is still part of the current Kabuki repertoire under the title "Kanda Matsuri". It starred Ebizô, Sawamura Tosshô I and Onoe Eizaburô III. 3rd lunar month of 1840: Première of the dance-drama "Kanjinchô" at the Kawarasakiza; Ebizô played the role of Musashibô Benkei [more details]. 8th lunar month of 1840: premiere at the Nakamuraza of the drama "Koi Minato Hakata no Hitofushi", a revised version of Chikamatsu Monzaemon's masterpiece "Hakata Kojorô Nami Makura"; Ebizô played the role of Kezori Kuemon [casting]. 4th lunar month of 1841: Ebizô played in the same theater the roles of Midaroku, the yakko Tagohei and Rakujinsai in the drama "Ichi-no-Tani Futaba Gunki". The role of Yoshitsune was played by his son Ichikawa Danjûrô VIII. 11th lunar month of 1841: Ebizô played in the same theater the roles of Kakuju, Umeômaru and Takebe Genzô in the drama "Sugawara Denju Tenarai Kagami"; the roles of Matsuômaru and Sakuramaru were played by Nakamura Utaemon IV and Sawamura Tosshô I. 3rd lunar month of 1842: Ebizô plays the eponymous role of the play "Kagekiyo", which was staged at the Kawarasakiza. His stage partners were Ichikawa Kuzô II (Shigetada) and Onoe Eizaburô III (Akoya). 4th ~ 6th lunar months of 1842: Ebizô was arrested and accused of violating the sumptuary laws. His sumptuous villa was destroyed and he was banished from Edo. "He was summoned before the city magistrates, bound in handcuffs and bound over into the care of his ward leader. On 22nd of the sixth month he was banished from the city. Changing his name to Naritaya Shichizaemon, on the 25th he left the city and took up temporary abode at the family temple of Shinshôji in Narita, several miles to the east of Edo. The following year he stayed for a couple of months with an oculist called Date Hon’eki near the foot of Mt. Fuji, before leaving for Ôsaka ". 11th lunar month of 1843: Ebizô played the roles of Kakuju and Matsuômaru in the drama "Sugawara Denju Tenarai Kagami", which was staged in Ôsaka at the Kado no Shibai. 11th lunar month of 1844: Ebizô played the roles of Kakuju and Matsuômaru in the drama "Sugawara Denju Tenarai Kagami", which was staged in Kyôto at the Kitagawa no Shibai; the roles of Umeômaru and Sakuramaru were played by Ichikawa Ebijûrô IV and Jitsukawa Enzaburô I. 11th lunar month of 1845: Ebizô played at the Kitagawa no Shibai in Kyôto the role of the warrior Kumagai Jirô Naozane in the drama "Ichi-no-Tani Futaba Gunki"; the role of Kumagai's wife Sagami was played by Nakamura Tomijûrô II. 2nd lunar month of 1847: Ebizô played the role of Yoshitsune in le michiyuki and the "Shi-no-Kiri" act of the classic "Yoshitsune Senbon Zakura", which was performed at the Kado no Shibai (Ôsaka); his stage partners were Arashi Kichisaburô III (Yokawa no Zenji Kakuhan), Ichikawa Kodanji IV (Tadanobu) and Arashi Rikaku II (Shizuka Gozen). 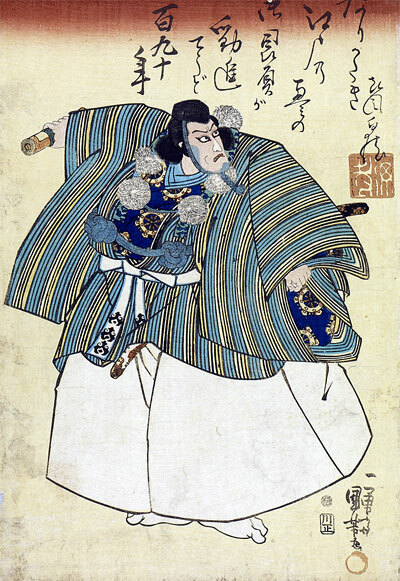 5th lunar month of 1847: Ebizô played the roles of Yoshitsune, Igami no Gonta and Yokawa no Zenji Kakuhan in Kyôto in the drama "Yoshitsune Senbon Zakura", which was produced at the Kitagawa no Shibai by the nadai Kameya Kumenojô and Hayagumo Chôdayû; his stage partners were Ichikawa Kodanji IV(Tadanobu) and Arashi Rikaku II (Shizuka Gozen). 9th lunar month of 1848: Ebizô played the role of Rokusuke in the drama "Hikosan Gongen Chikai no Sukedachi", which was staged in Ôsaka at the Kado no Shibai; the role of Osono was played by Arashi Rikan III. Ebizô also played the roles of Kakuju and Matsuômaru in the drama "Sugawara Denju Tenarai Kagami". 11th lunar month of 1848: Ebizô played the roles of Kakuju and Matsuômaru in the drama "Sugawara Denju Tenarai Kagami", which was staged in Kyôto at the Kitagawa no Shibai. 12th lunar month of 1849: he received a pardon from the authorities. "In the first month of the following year he was summoned back to Edo, and after a hurried departure he arrived in the city on the 29th of the second month ". 3rd lunar month of 1850: Ebizô played at the Kawarasakiza the role of the warrior Kumagai Jirô Naozane in the drama "Ichi-no-Tani Futaba Gunki"; the role of Kumagai's wife Sagami was played by Onoe Kikujirô II. 9th lunar month of 1852: Ebizô plays at Kawarasakiza the role of Midaroku in the drama "Ichi-no-Tani Futaba Gunki"; the role of the warrior Kumagai Jirô Naozane was played by his son Ichikawa Danjûrô VIII. 1st lunar month of 1853: Ebizô was summoned one more time before the city magistrates (machi bugyô). 1st lunar month of 1853: Ebizô played at the Kado no Shibai the eponymous role of the play "Kagekiyo"; his stage partners were Ichikawa Danzô VI (Akoya) and Kataoka Gadô II (Shigetada). 5th lunar month of 1853: Ebizô played one more time the eponymous role of the play "Kagekiyo" in Kyôto at the Kitagawa no Shibai. 4th lunar month of 1854: tour in Nagoya at the Wakamiya no Shibai. He performed under the name of Naritaya Shichizaemon the eponymous role of the drama "Kagekiyo". 8th lunar month of 1854: a few days after his triumphant arrival in Ôsaka, his son Ichikawa Danjûrô VIII committed suicide in his inn. 6th lunar month of 1855: tour in Nagoya, where he performed under the name of Matsumoto Kôshirô. 11th lunar month of 1855: he played the roles of Dankurô and Saisaki Iga no Kami in the drama "Shin Usuyuki Monogatari", which was staged in Kyôto at the Minamigawa no Shibai. 1856: he took one more time the name of Ichikawa Ebizô V.
1st lunar month of 1857: Ebizô played for the last time the role of Musashibô Benkei in the dance-drama "Kanjinchô", which was staged in Ôsaka at the Naka no Shibai; the roles of Togashi and Yoshitsune were played by Ichikawa Ebijûrô IV and Ichikawa Kôzô. 10th lunar month of 1857: he performed under the name of Ichikawa Hakuen in Ôsaka at the Kita no Shinchi Shibai. 1st lunar month of 1859: premiere at the Nakamuraza of the Nagauta-based sanbasômono "Kotobuki Shiki Sanba"; Ebizô played the role of Okina [casting]. Ebizô suddenly fell ill and had to rest a few weeks. 3rd lunar month of 1859: Ebizô was supposed to play in the same theater the roles of Daihanji no Kiyosumi and Soga no Iruka in the drama "Imoseyama Onna Teikin" but he had a relapse and died the 23rd day of the 3rd lunar month of 1859 . Ichikawa Ebizô V was an outstanding tachiyaku and one of the most popular actors of the nineteenth century. The 23rd day of the 3rd lunar month of the 6th year of the Ansei era was the 25th of April 1859 in the western calendar.